the Melbourne Prize for Music (to be awarded next year, 2016). Each annual Melbourne Prize is valued around $100,000, depending on the range of prize categories in each sector. An initiative of Executive Director and Founder Simon Warrender, the Melbourne Prize Trust was established in 2004. It was launched following the unveiling of the children’s garden precinct at the Royal Botanic Gardens Melbourne and the commissioning of The Magic Pudding sculpture, by Louis Lauman, in 2000. Click here to see it, it’s no 18 on page 2.) (You can buy a limited edition bronze miniature if you have spare cash. All proceeds support the Trust ). The Trust is a not-for-profit cultural organisation which provides financial, career development, travel and exhibition opportunities for Victorian writers, musicians and sculptors, via the annual Melbourne Prize. It’s funded by cross-sector public, private and corporate partnerships, and donations from small donors like me (which is how I got to know Simon). It’s a community investment that directly benefits Victorian arts. Every year during the prize season when there are the inevitable disappointments that this or that personal favourite has been overlooked, I sometimes wonder if the judges were aware of the alternatives. The Melbourne Prize gets round this by convening a high profile judging panel each year so that leaders in each sector are exposed to a broad range of artistic talent. This not only enriches the pool of judges so that there are more of them with expertise, it also gives artists the opportunity to profile their work to eminent professionals in their field. In 2008 Melbourne was designated a City of Literature along with Norwich, Edinburgh, Iowa City, Reykjavik, Krakow and Dublin, all cities where literature plays a central role in the urban environment. 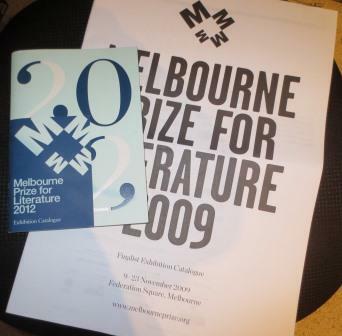 With its valuable literary award under the banner of Melbourne, the Melbourne Prize for Literature 2015 adds to the range of literary activities here, including the Premier’s Literary Awards; the Melbourne Writers Festival at Federation Square; and a plethora of other literary festivals across the state. (For some odd reason the Wheeler Centre doesn’t maintain its own calendar of our LitFests so organisers have to add their festivals to it themselves, which is a bit clunky. However there is what looks like a comprehensive list at Writers Victoria ). These various literary initiatives in Victoria raise awareness of our immense local literary talent and strengthen our position as a place of opportunity for writers locally, nationally and on an international basis. The prizes cover a range of career stages, and each culminates in a free public two-week exhibition of finalists’ work at Federation Square each November, plus the main prize presentations at Deakin Edge in November. The Trust prints a free exhibition catalogue for the public during the event and for the finalists to retain as a record. The Civic Choice Award enables the public and visitors to the exhibition to vote for their favourite, which in 2015 will be a writer, who has the chance to win $5,000. 2012: Craig Sherborne, The Amateur Science of Love (Text, 2011). 2009: Nam Le, The Boat (Penguin, 2008). 2006: Christos Tsiolkas, Dead Europe (Random House, 2006). The Prize and Award offering this year will be similar to past years with one addition. As part of continuing the 10th anniversary celebration of the annual Melbourne Prize, a significant new award will be offered, details of which will be released in May, along with the entry form. The judging panel in 2015 will follow the same strategy as 2012 and will include five esteemed figures in the literary sector. (The 2012 judges were Mark Rubbo OAM, Professor Brian Matthews, Hannie Rayson, Christos Tsiolkas and Michael Williams). Federation Square will again be the site of the finalists exhibition in November to showcase the outcome of the competition. Who will the nominees be? Take a guess from my list of Authors from Victoria but remember, they’re only the ones I’ve reviewed on this blog, so feel free to suggest others. Currently, one can register interest to receive information on the 2015 program when it becomes available by visiting http://www.melbourneprize.org. The Prize is open to Victorian residents only. the Civic Choice award (where we get to vote for our favourite). We have to wait till May to find out, but in the meantime we can guess, eh? I’m hoping for a Biographers’ award (and I’d nominate Brenda Niall). What about you? Please add your suggestions in comments below. To whet your appetite for this prestigious prize, here are some photos from the 2012 Melbourne Prize. All photos courtesy of Leisa Hunt Photography. Many thanks to Simon Warrender for his input to the preparation of this article. Your comment “Every year during the prize season when there are the inevitable disappointments that this or that personal favourite has been overlooked, I sometimes wonder if the judges were aware of the alternatives” made me think. I have two comments on this. One is that I think that no matter how broad and knowledgeable the judging panel, the decision is in the end has to be subjective and there’s always going to be someone who will feel their favourite or a better work missed out. (The ensuing discussion is usually good for our literary culture, methinks, though that’s small comfort I realise for those who didn’t win!). Secondly, re the judges not being aware of alternatives, I think it comes down to how the books are nominated in the first place. I sense that in most cases the judges are simply presented with books by the competition organisers and that’s what they have to work with i.e. I think they usually don’t get to decide what books they will consider? I would love to understand better just how the back end happens (I think it is different with different awards.) Dorothy Johnston talks about working through the 72 entries in the Barbara Jefferis Award. The word “entries” suggests to me that she and the judges were told these are the 72 books they were to choose from? When I’ve looked at awards before I recollect seeing entry forms. I wonder if, in these cases, whether the judges are allowed their own wild card entries!! There’s been a couple of times when shadow juries (the Giller, the IFFP) have ‘called in’ an extra title when they’ve felt that an important book has been omitted from a shortlist, but I don’t know of this happening in other situations. PS No, I don’t know of those two civic choice authors, they seem to have come right out of left field, and I haven’t had time to hunt around on line to find out more about them yet. Yes, you’re right about the MF, and I have often wondered too about that being a qualification. Not all library directors are lovers of/experts in Australian literature. As you say the composition of the judges clearly has a role to play, and those Giller and IFFP examples show that in some instances at least judges can call in other books. That’s probably not always the case I suspect. Let’s see if any judges or awards trustees see this post and answer it. Maybe they are sworn to confidentiality! Hmm, found Henry von Doussa at the NLA with a book The park bench published by Australian Scholarly Publishing. He’s at or was at La Trobe. Masters in Creative Arts. Sounds a little strange for a Civic Choice? I am a fan of Helen Garner books. I love her writing style. She always captures the mood and her characters so well. And, when she writes about Melbourne she is spot on. Her non fiction book, This House of Grief, is no exception. It follows the trial of Rob Farqharson, the man who murdered his three sons. The details of Melbourne, the Supreme Court,, the transport system, and the people are as interesting as the trial itself. Well, although I admired her early work, I’m not since Joe Cinque’s Consolation a fan of Garner’s dissections of tabloid crime. (She’s an author who polarises opinion, I believe, so I am not alone). Her choice of topic for her latest effort appalled me though other reviewers that I respect thought differently. But there is no doubt that she is an author of considerable status and that she has a substantial body of work, so I wouldn’t quarrel with the judges’ decision.